This weekend marks the 50th anniversary of the founding of the Black Panther Party. At the time, they were hated and feared by every official institution of US capitalism. Today, many of those same institutions are trying to make them safe. But what they stood for and what they did was not “safe” then and it isn’t now. The idea that black people should patrol their communities, guns in hand, keeping the police in check was truly revolutionary. It was a tremendous threat to the police then. It still is. And it stands in vital contrast to all the reformists today who today don’t go beyond calls for civilian police review boards, “community control of the police”, etc. Today, along with guns – where it’s possible to carry them – similar patrols could carry video cameras as well. 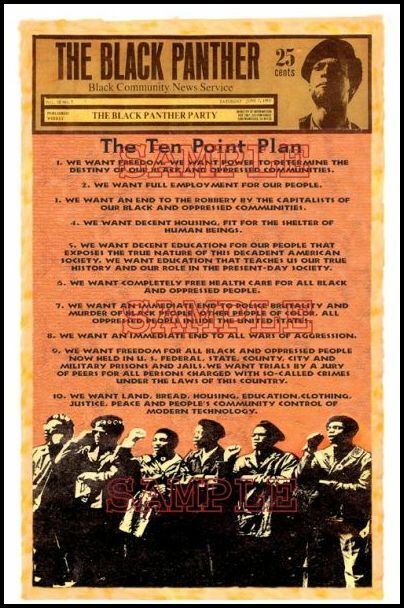 Their ten point program is also as relevant today as it was 50 years ago. While the Black Panther Party focused on the issue of the police, the economic demands they raised were just as important today as then. The socialist and the revolutionary movement should honor the Black Panther Party, but the only way to do so is to learn from both what they did right as well as their mistakes. And all movements make mistakes, from the Russian Bolsheviks right up to the present. The Black Panther Party believed that “the lumpen”, as it was called by them and others – the perpetually unemployed, those living by their wits (and courage) alone – would be the revolutionary force in society. They did not see the employed working class as playing a basic role. Connected with this, they did not really see a road towards organizing the working class. While they took up economic questions in their program, it’s hard to see where they actually organized around those economic questions. This was connected with their nearly exclusive focus on “the community”, to the exclusion of organizing at the point of production, the work place. Much is made of their free breakfast program. This was organized in the era when Mao and Maoism was popular within the revolutionary left in the US, and the watchword of Maoism was “serve the people.” It seems unlikely that the Black Panther Party thought they could actually overcome the economic crisis in the black community. It seems much more likely that their free breakfast program was intended as an avenue to build a wider base. But that, in itself, shows the problem. The best, in reality the only way to build a wider base is to find a way to get increasing numbers involved in organizing to fight for their interests. That means really organizing around many of the economic demands of the Ten Point Program. But how is that possible without also organizing at the work place? And how can that be done without organizing all workers? How can the for jobs, housing, education be won for some if it can’t be won for all? And how can we even begin to fight for such demands if we don’t combine these struggles with a struggle to transform our unions? Today, even more so than 50 years ago, those demands are vital for all sectors of the US working class. Today, some revolutionary groups try to follow the example of the Black Panther Party by instituting programs similar to the free breakfast program. They are copying a mistake the Black Panther Party made, one made from a lack of seeing a clear road for how to translate the economic demands into actually organizing workers as workers, instead of learning from and basing themselves on the tremendous things the Black Panther Party did right. So today, we should honor the courage and the depth of thinking of the Black Panther Party founders. We should carry that forward. Not in a mechanical fashion, but learning from and build upon their example, which does not mean simply examining what they did uncritically.